Derby and I have finally broken through a plateau, and I’m really excited about my lesson tomorrow night. Last week we finally started producing a show-ring quality trot with real bend, roundness and connection. We’ve just passed our one-year anniversary together, and we’re putting in some good work – finally. Saturday and Sunday I rode on my own (not in a lesson.) I swore to myself that I would build on my progress over the last week, focusing on maintaining energy and roundness simultaneously. I’ve also been working on sharpening Derby’s responsiveness to my aids, which takes a lot of very deliberate and focused riding from me. I got out the barn early on Saturday. All the horses were inside due to some storms that rolled through earlier, and Derby had quite a bit of extra energy to burn. I actually considered longing him at the outset, but then decided that I needed to work on dealing with extra energy, like I have to do at shows. Could I get him to focus on me, stay on the aids and work correctly? The answer is yes. I put Derbs to work immediately, instead of walking around on the buckle. I loosened his jaw, poll and neck, moving him around and flexing him right and left. We stretched down. We spiraled in and out. We did serpentines. And pretty soon, I had a nice, responsive horse. Once that was achieved, I focused on the trot work, riding lots of patterns and maintaining the energy and forward, while also working in some torture in two-point and some sitting trot too. Derby’s back was up for the most part and things felt pretty good. Sunday I was tired, and I’ll admit it, a bit hung over after a late night out with some friends. The sun was beating down and I wasn’t very motivated, but we ended up having a really good ride. After warming up inside, I took Derbs to the outdoor, to see if we could replicate our work outside, in a different and more distracting environment. I put him straight to work in the outdoor, not taking a minute to walk around and look at things. We didn’t have the energy we did on Saturday, but it was hot as Hell out there in the sun, and I settled for round, steady contact, and we achieved it pretty quickly. We did several laps and some excerpts from some tests, and Derby’s back stayed up, and the contact was steady. Between the heat and the deeper outside footing, I didn’t push it. We hit the showers after accomplishing what I set out to do. It’s been a process to get to this point. And now that I’m starting to get correct work, I know the next steps will be to take the time to build the correct muscling that will enable Derby to carry us nicely into Training level, while building the trot and then repeating everything for the canter. So, a lot remains to be done, certainly, but the path doesn’t look as steep and bumpy as it did three weeks ago. 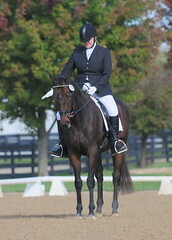 I’ve spent a fair amount of time watching Christy ride her horses, and while I always learn a lot, watching her develop Remy over the last year has been especially informative, chiefly because in taking the skinny young OTTB from the track to the dressage ring required her to instill rhythm, contact and cadence in the horse. Within a few months of his arrival, Christy had Remy going well, and I especially enjoyed watching her work the long-legged boy at the trot, improving his use of his back. They would go around the arena, doing circles and serpentines at a spanking gait, with Remy staying round and yielding nicely when Christy asked for bend. I memorized what that looked like. And I’m trying to emulate it. I know that she really had to work for that nice gait on Remy when he was greener, and part of that work was finding – and holding – her balance. While Derbs is no Remy, he is similarly sensitive to my position, providing me instant feedback on how I’m sitting. The degree of his forward motion varies directly with my balance and position on his back. So instead of “trotting like Remy,” really, I need to be thinking “sit like Christy” in order to produce the big, forward, flowing gaits I seek. And I got a bit closer to getting there this week. Thursday night’s lesson focused on many of the same things I noted in my post on Wednesday, and once we got warmed up, I had a very decent working trot going that Derby was pretty much sustaining. But I have struggled with maintaining that gait when we do anything other than go down the long side. So I was paying particular attention to my position (and the horse’s feedback) in my lesson. As we continued working, things improved, until finally, we were doing a very nice 20m circle around Christy, who had become effusive in her praise. I had contact, I had forward, I had bend — and it was all pretty easy, I didn’t have to work to hold it. What had I done? Well, in addition to the checklist I noted in my blog post on Wednesday, I had added one more thing. Core engagement. When I engaged my core, I could feel my hip angles opening as my leg lengthened and I sat up taller. Derby immediately responds to this – when I finally put myself into the right position, he rewards me immediately by rounding and carrying himself nicely. Use the inside rein. If he doesn’t respond to a softening of the inside rein, and continues to hang, get busy with the inside leg while insisting with the inside rein (e.g. a direct rein). My desire to not hang on the inside rein has gone a bit too far. I am allowed to use it. When Derby feels “stuck” and braced against me, I need to mix it up. Flex him, do serpentines and leg yields – anything to get that neck unbraced and softer. Do as little as you can do but as much as you need to do to get the response you want – but be mindful. If the horse doesn’t respond when I ask nicely, I have to next ask not-so-nicely. Accepting no response results in a dull horse that’s dead to the aids. 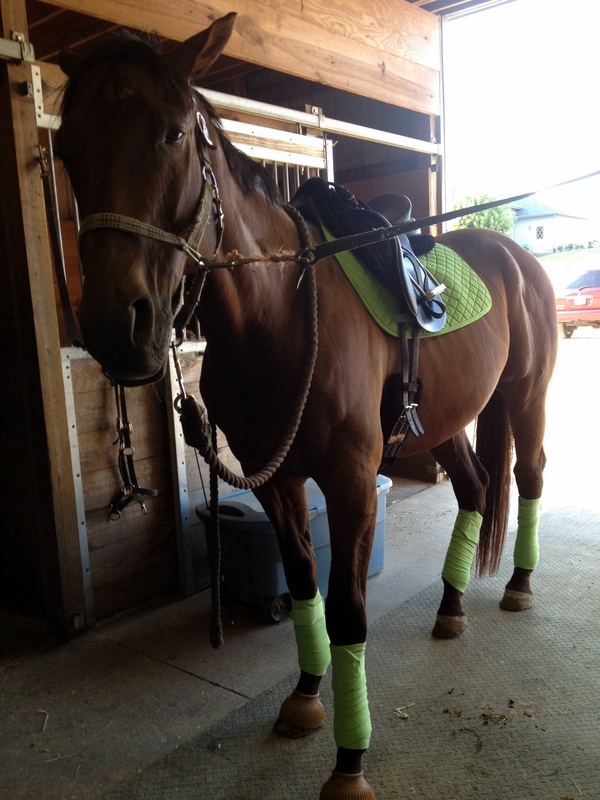 Ride with my core engaged, and my leg long and draping around Derby’s sides. In other words, sit like Christy! We worked on bend tonight, and made some progress. I’m finally getting my strength back to the point where I can start worrying about other things than not banging the saddle when I post or steadying my hands. Gait quality has been better of late, but I’m still allowing Derby to go around with his nose poked out like a little hunter. So staying round, through, bending and forward are very much on my mind these days. Pick 'em up, put 'em down, Derbs. The theme of the next few weeks, Christy informed me tonight, will continue to be “Fix it – NOW.” And the sub-theme needs to be “Ask nicely, then correct.” I’ve been rewarded when I ride more assertively and responsively recently, and I need to continue to speed my deployment of fixes – and reduce my tolerance for a less than crisp response. 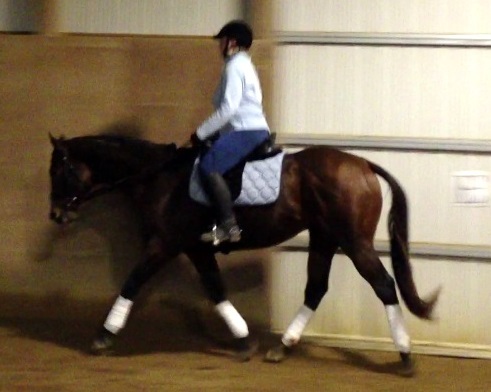 Tonight’s ride focused on getting the hind legs engaged. 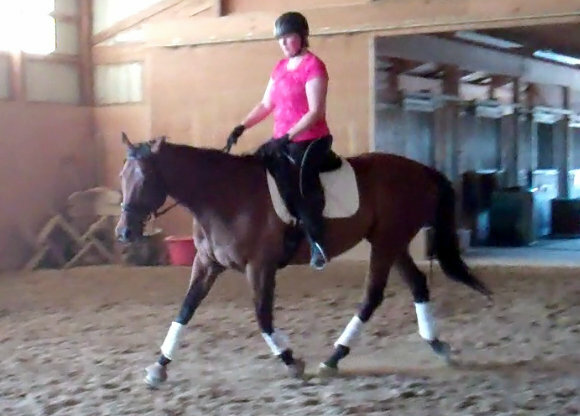 The trot work improved after we cantered (got both leads, nice transitions, yay) but not before I started to wear out, due to the effort I expended at the beginning of the lesson. 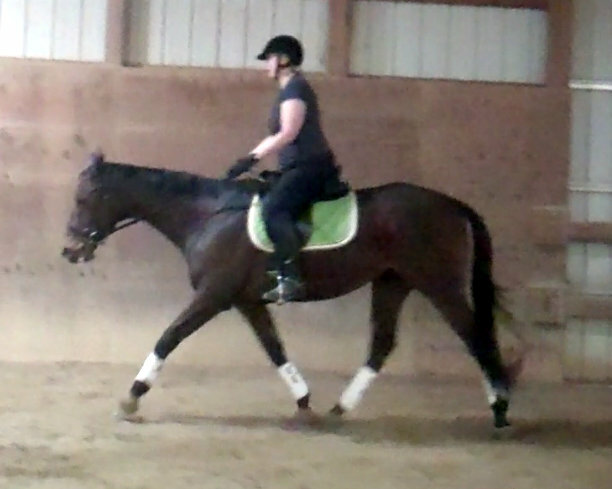 I was working harder than the horse was at the outset as we worked on developing a good quality trot circle. Toward the end of the lesson, I needed to switch things up, as my legs were getting tired after the circle work. We decided to do big laps, focusing on getting Derby to really step out. He was moving nicley but I can feel the difference in his fitness a few months ago, and his fitness now. I know that as he gets fitter (and as I do too) the quality of our work will improve. In this sport, one thing leads to another. On my way home, I mused about all the work we need to do and the things we need to practice, an I admonished my self not to get impatient with the horse, or with myself, for that matter. As Christy said, I need to focus on fixing issues as they arise, in the moment. And I can do that. As I continued to muse, my subconscious fixed on the word “Fix” and connected that to a video I watched about eleventy-billion times back in the day. For those doing the math, yes, I saw MTV’s first video, yes, I was a child of the 80’s. Here is a very apropos selection for your enjoyment. I can die happy. A moment of suspension, on the bit. Thank you, Lord. And Derby. And Christy. Tonight as I warmed up for my lesson, Christy and I talked about what Liz had captured when she shot some video (unknown to me) a few nights ago. For your reference here it is – three minutes of fairly uninspired riding. A few things are apparent from this video. First and foremost, I’ve lost the position I’ve been working on – my hip angles are closing a bit, and I’m pitching forward, which on Derby is like stomping the brakes. Secondly, the contact is really inconsistent – we’re only round and on the bit oh, maybe 30% of the time. At about 2:00 I do manage to correct myself (somewhat) but at this point it also becomes apparent that I’m acceptng a pretty ho-hum trot from Derby. Forward is still an issue. So Christy set some new priorities for us, starting with forward, which will help with both the consistency of our content and gait quality. 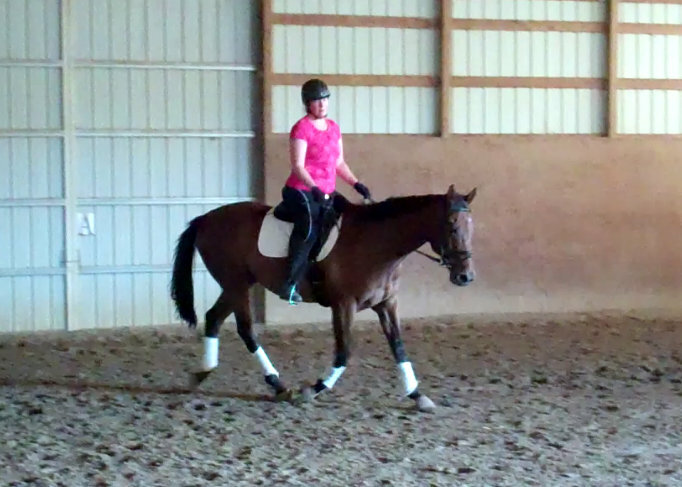 She also threw trot poles into the mix, to encourage a more dynamic trot. We got some good work going to the left and got some fancy footwork over the poles. Then we took walk break, talking through a few things, and I picked up the reins to go back to work. Derby, on the other hand, was checked out. He was done, or so he thought. Bless his furry little soul, he was wrong. We still had a good 20 minutes to go in our lesson. To say that forward was a problem would be an understatement. After getting no response when I asked him to move forward, I booted him into a canter. As you can see in the video above, I had to pop him with the whip a few times to keep him going. After that canter interlude, however, we got some really good work, right before the 3 minute mark. From that point onward, I was able to keep Derby forward with consistent contact. What was different? A few things. First and foremost, I rode proactively, making corrections, half halting – essentially managing every stride. Secondly, I really tried to maintain a balanced position. And finally, I really kept my core engaged. Wow, what a difference. Around 2:55 in the video, we start to get some of our best work ever. Derby is uphill – we even generate some suspension. “THAT is your working trot!” Christy exclaimed. 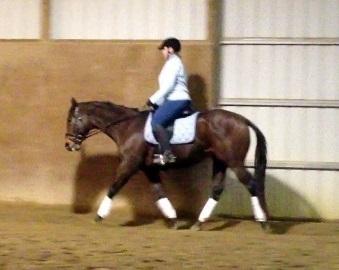 “That’s the show ring trot!” I have to make this the new normal. PS: This is for those who say that riding isn’t hard work. Look at the steam roll off me after living through my lesson with Christy! I squeezed another lesson into Christy’s schedule to deal with the issues that cropped up on Monday night. I’m happy to report that we had a nice ride, Derbs thought about looking at nothing once but we dealt with it, but that was it. I suspect two issues contributed to my right-lead difficulties on Monday. First, I need to do a better job of producing good bend. I’m simply not asking for it. I need to practice generating bend whilst maintaining my new-and-improved position – which is kind of hard for me – Christy noted that I was letting my knees creep up, effectively closing my hip angle. Hmm. No wonder my forward gears were petering out. Christy observed that Derby is a ‘seat ride’ and is very responsive to little things – such as when I close my hip. On the up side, this does give me instant feedback, so I am alerted that there’s something I need to fix. The other issue is actually horse-related. I’ve really upped my riding recently, and Derbs is working harder. He was getting tired on Monday night. I need to build his fitness, and respect the fact that as I up the ante, I need to work him within that context. We need to get those sadde pads wet. For last night’s lesson, Christy had me ride a big four-leaf clover. It was an ideal exercise to practice bending one direction, especially for where I’m at, because it includes moments of straightening which I needed to reorganize. To ride the clover leaf, I essentially rode a loop in each corner. So to start, you’d ride from A to C, turning right at C, and then turning right again at B, bisecting the arena and riding straight to E, turning right and doing a loop in that corner, turning right again at C, riding straight to A, turning right at A, doing a loop, turning right at E, riding straight to B, turning right … you get the idea. It rides nicely and affords lots of bend/straighten/bend practice. Rinse and repeat going the other direction. One other thing came to the fore last night – I’ve been letting Derby sucker me into a less good-quality trot. Christy got us back on track last night, telling me to ride like I was doing a lengthening. “Now that’s your trot!” she exclaimed as we powered down the long side. My challenge here is to keep my knees down and hips open, to guard against losing that forward impulsion. New red duds for December. I’ve been working hard since my last lesson, in which Derby was dull and the ride was generally uninspired. Developing Derby’s forward gears and maintaining engagement and roundness in the transitions have been my primary foci. However, as part of the working on forward equation, we’ve been doing more work at the canter. Overall, I’m pretty happy with the quality of my homework and am looking forward to my lesson tomorrow. Derby was good yesterday and really good today – we had some very nice trot work including some bending serpentines in which we maintained impulsion and had good bend. In the back of my mind today was also the imperative to start working in more correct bend. When I remembered, I rode bend going into corners, and given the traffic in the arena today, I also had to do changes in direction and line. We did lots of circles and the quality of that work was some of our best. Early in the ride, I put Derby into a canter, keeping transition quality in mind. 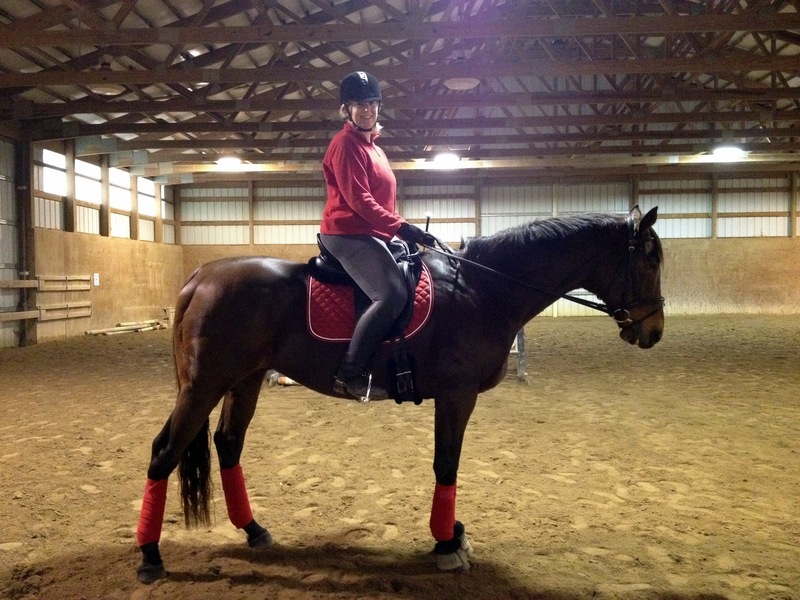 I also wanted to start doing a better job of riding the canter – holding the contact, pushing the horse into it. and also engaging his hind legs. 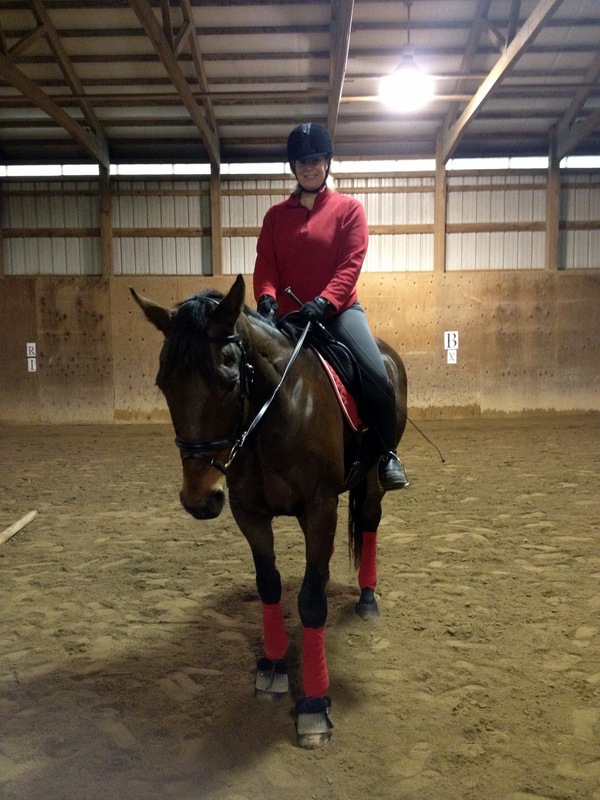 Today was – I think – our best canter ever. Derbs was enthusiastic – he didn’t peter out but instead held the tempo – and I was able to sit up and ride circle that felt balanced. I also got the horse to move out from that circle – I’m not sure I’d go so far as to call it a leg yield , but it was in that vein. 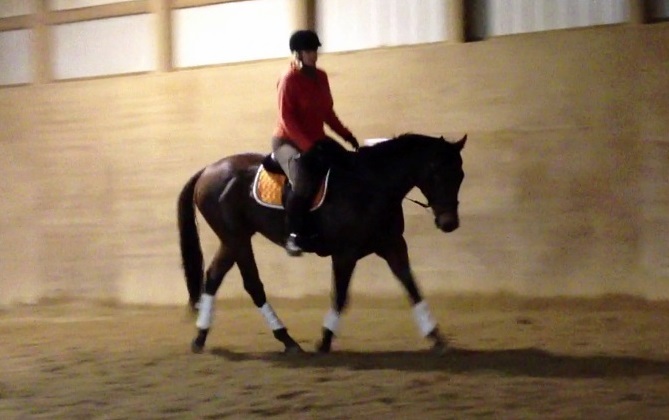 We’ve also schooled transitions ( trot / walk / trot) over the last few rides. First I had to develop more responsiveness from Derbs – you need energy to maintain engagement. The transitions have improved incrementally from ride to ride, as I do a better job of riding them – using my half halt and getting the horse to soften while staying in the bridle by holding the reins, engaging my core and closing my legs going into the transition. You have to ride downward transitions forward – which is really counterintuitive for me and something I struggle with. It’s not great yet but we’re doing better, which is enough for me!